Chris Wilson, a member of Lakeside GC, was elected president of the Southern California Golf Association at its Annual Meeting, held Tuesday morning at Brookside GC in Pasadena. He succeeds La Jolla CC member Jon Bilger. 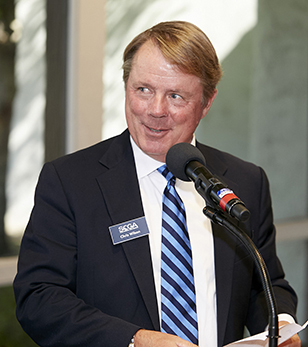 “I can't tell you enough how much I'm looking forward to serving as the next SCGA president,” said a humble Wilson. “I'm excited to expand our women's programming and lead the SCGA's support of junior golf through our foundation. It's going to be a great year." Joining the SCGA Executive Committee are Vice President Fred MacFarlane of Industry Hills GC, Secretary Bob Livingstone of El Dorado Park GC and Treasurer Nikki Gatch of Emerald Isle GC. - Gary Wilson, who received the Jim House Award, which recognizes the work of an exceptional SCGA volunteer. Wilson’s support of SCGA Championships has been above and beyond for 30 years. - Brad Zlomke of Olivas Links GC, who was named the winner of the Newell Pinch Delegate of the Year Award for his service working as an SCGA ambassador. - Rae Merhar of La Jolla CC, who was awarded the Don Carlson Handicap Chair of the Year Award for her accomplishments as the Handicap Chair of La Jolla CC. - The Capital Group received the John Argue Founder’s Award, established to honor SCGA Junior Founder and former SCGA President John C. Argue. Newly-minted SCGA board member Matt Lyons accepted the award on behalf of the Los Angeles-based financial firm. - Ted Gleason was honored with the President’s Award, annually given to an SCGA member or member club who’s dedicated to furthering the mission of SCGA Junior. Corby Segal earned his first SCGA Player of the Year Award after a stellar 2018 season. His campaign included a runner-up at the SCGA Mid-Amateur, third place at the SCGA Amateur and he qualified for both the U.S. Amateur and U.S. Mid-Amateur Championships. Elizabeth Wang was recognized as the first-ever SCGA Women’s Player of the Year. The SCGA Junior Scholar Award winner is currently attending Harvard and made the cut at the U.S. Women’s Open Championship this summer. She also made the Round of 16 at the U.S. Women’s Amateur Championship. Craig Davis earned the SCGA Senior Player of the Year honors after winning the SCGA Senior Amateur, advancing to the semifinals of the SCGA Senior Match Play and making it to the quarterfinals of the U.S. Senior Amateur. He also finished third in the California Senior Amateur Championship. Kathy Kurata was honored as the Senior Women’s Player of the Year after winning the Senior Women’s Amateur Championship, Women’s Tournament of Club Champions and finishing in second place at the SCGA Women’s Four-Ball Championship. She also qualified and made the cut for the inaugural U.S. Senior Women's Open Championship and advanced to the quarterfinals at the U.S. Senior Women's Amateur Championship.